Massage goes far beyond the support of your physical well-being. It embodies one of the most basic and essential forms of communication – a subtle language spoken between client and practitioner. Massage uses the base element of “touch” and takes advantage of its deep healing properties by manipulating the fascia, tissue, muscular, nervous, spinal fluid, meridian, and lymphatic systems for relief from physical and emotional discomforts. There are an incredible amount of diverse modalities within massage, each of which seek to offer customized experiences to the client, based off of his or her needs. From Swedish to Medical, Myofascial to Rubenfeld – choices range from the lightest of touches for deep emotional release, to truly technical deep tissue work, and all help to bring your body to its greatest harmonious state. One of the uses of massage that I find most fascinating is that pressure applied to certain meridian points (TCM) can directly stimulate not only your inner organs, but areas of the brain as well. On its own, a gentle touch can release dopamine hormones in the recipient, which seem to wash over you, coaxing you into a relaxed state. Massage builds on this form of release, manipulating the flow of crucial bodily fluids and hormones with different pressures and techniques. Modalities that focus on these techniques include Craniosacral, Manual Lymphatic Drainage, Reflexology, and Acupressure – to name a few. At Medical Massage Group, we see clients with all sorts of aches and ailments. As Summer grows warmer, we find that more and more clients with headache- and migraine-related issues reach out to us for help. Now – headaches and migraines, both very unpleasant neurological reactions to a wide range of bodily dysfunctions and toxins – are not inherently the same. Each vary in intensity and can affect different areas of the brain, which means no two clients with these symptoms will be treated exactly alike. A massage focused on alleviating headache pain will address the cause, as well as the symptoms. Most therapists routinely target certain meridian points in the face, head, and neck by pressing down with their thumbs and fingers for a few moments. Although you may feel some discomfort, acupressure is meant to help release muscle tension that may be blocking the flow of blood (and therefore oxygen) to key areas of your body. Ask your therapist to share their insights with you during your session, and – especially if the issue is chronic – to give you self-care advice so you can manage the issue in between sessions. As a quick disclaimer, self-care takes a lot of dedication - and any form of healing requires many facets of awareness. Almost no physical issue is restricted to the physical body alone; most are tied to ailments in the subtle bodies as well, brought about by “bad” habits or some form of mental/emotional/existential trauma. Try addressing your physical needs as well as the needs of your subtle bodies the next time that debilitating headache or migraine hits – using touch, meditation, stretching techniques, nutrition, aromatherapy, and (of course) massage for the most satisfying and well-balanced results. Self-acupressure is a great way to relieve headache-related pain! Try pressing down on these essential meridian points to assist you when you feel a headache or migraine coming on - and make sure to drink PLENTY of water while doing it! 1) Third Eye Point - this point is found between the eyebrows. Stimulate this point to relieve head congestion. Hold for one minute. 2) Drilling Bamboo - located at the inner corners of both eyes, this point is great for headaches located in the front of the head. Press firmly; hold for one minute. 3) Welcome Fragrance - this point is great for migraine and sinus relief. Press the points located on either side of your nostrils, near the bottom of your cheekbones, for one minute. 4) Feng Chi - try this one for more severe migraine symptoms. Place your thumbs at the two hollow points just below your skull. Cup your head for support, and press your thumbs firmly for up to 3 minutes. Best when done in 4 second bursts, massaging the points with your knuckles in between. 5) Temple Region - there are several points located in this area, and each are about a finger-width apart from the other, curving over and behind your ear. Press down with all 5 fingers on each side with either continuous pressure, or in a circular motion, for one minute. Give each point individual attention for best results. 6) Wind Mansion - this one is great for migraines relief, stiff necks, and alleviating mental stress. It's located in the hollow at the very base of your skull. Press down for one minute. 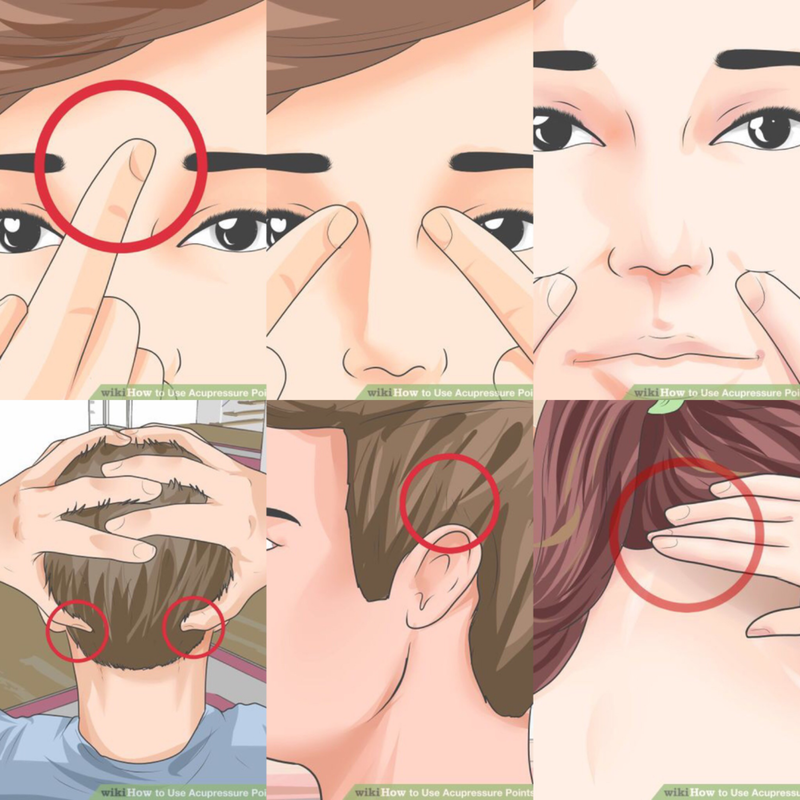 Click here for more info and acupressure-point suggestions.